As Parliament debated the 1905 Finance Bill Liberal politicians argued to reduce defence expenditure, arguing that government funds should be diverted towards social reform. In the 1906 General Election the Liberal Party won a majority, and subsequently introduced wide ranging education, health and welfare reforms including free school meals for some children, attempts to increase the numbers of children in secondary education and pensions for those over 70 years old. The Liberals would continue to debate military spending; in August 1905 they argued in the Naval Works Bill that spending on the Navy tended to escalate far beyond what was initially planned or promised in Parliament. A major issue in the debate surrounding the 1905 Naval Works Bill was the large amount of borrowing proposed in order to cover the costs. The government planned to repay this money over 24 years, which was considered unfair to future generations. 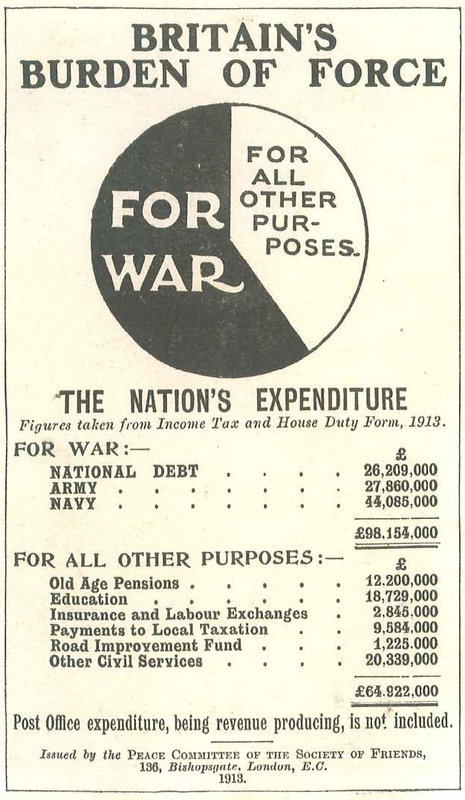 Despite ‘a unanimous expression of opinion against the system of borrowing for military and naval works’, the government seemed intent on spending on the army and navy, whether or not this increased public debt. An underlying question seemed to permeate the debate, why in times of peace was so much investment being channelled towards arms? The example of the army boot makers is important. There had been strikes in Northampton over Army Boot contracts which had broken a previous wage agreement. The contracts meant a cut in the wages of the workers. In the case of the women employed to ‘close’ boots the amount they got per dozen dropped from the agreed two shillings sixpence to one shilling. Their wages therefore fell from 15 shillings a week to six shillings, a large proportion of which was liable to be taxed to pay off the country’s war debt. Another Liberal, Joseph Walton wanted more money spent on education and less on the military. Education spending had increased by £6,000,000 while spending on the Army and Navy had grown from £35,500,000 to £71,250,000, he said. Two weeks later, Francis Channing again entered the debate, this time to argue that the sugar tax should be abolished. This was a vestige of war taxation that had remained in place since the Boer War ended in 1902, and which, as a commodity tax, affected poorer tax payers disproportionately. When the sugar tax was introduced it was estimated the Boer War had cost £148,000,000, and £127,000,000 would be borrowed to meet its costs. Despite the enormous debt built up during the Boer War, the government continued to spend on the military regardless. The sugar tax was not the only war tax taken through into peace time because of the war debt; others included tea, tobacco, beer and spirits. Such taxes on consumer goods like tea and sugar hit the poor hardest. Channing lost the vote to scrap the sugar tax after Austen Chamberlain, then Chancellor of the Exchequer, defended its continuation. Only six years later, he would be heading the Ministry of Munitions, aiming to ensure the supply of armaments for a different kind of war. However, the resounding success of the Liberals in the 1906 election meant spending was governed by social, rather than military priorities for a brief period. After the war the social vs. military spending debate would be renewed once more. Military spending now comprises six percent of government expenditure. This is a much lower proportion than before the First World War because of increases in other government spending such as health, education, and welfare. The UK still has the sixth highest military spending globally and the Ministry of Defence has faced much smaller cuts than many government departments since 2010. When the UK Government claims that there is not enough money to continue to pay for public services such as health, welfare, and education, it is worth considering the military expenditure that they are willing to pay for. The government has little problem paying for such things as fighter jets, aircraft carriers and nuclear weapons. The government spends 30 times more on weapons research than tackling climate change. Because arms jobs are paid for by taxpayers, resources can be redirected, and by shifting their priorities from defence spending to combatting climate change, the government could have a dramatic impact. They could secure green jobs for the future and improve, rather than threaten, human security. Every year £700 million of public money is spent supporting arms exports, often to countries in conflict and regimes that abuse human rights. This subsidy is handed to an industry that accounts for fewer than 55,000 jobs.